I once knew a person who referred to the 4th of July as the “halfway” point of the summer. And I thought I could be a pessimist! Yet, here it is already July 1 and I have to admit that summer does feel like it is going to fly by unless we take it upon ourselves to slow it right down. Does anyone have any clever ways to do just that? My formula for what I hope will be a slow summer is a healthy serving of family and friends, time spent outdoors, walks on the beach, some great food and cocktails and of course, a captivating book or two. And don’t forget about your weekly dose of The Kitchen Scout. I still hope to be posting on the weekly throughout the summer. In the meanwhile, who remembers (or still enjoys) that old-school onion dip made with a packet of dry soup mix and some sour cream, traditionally served with Lay’s potato chips? 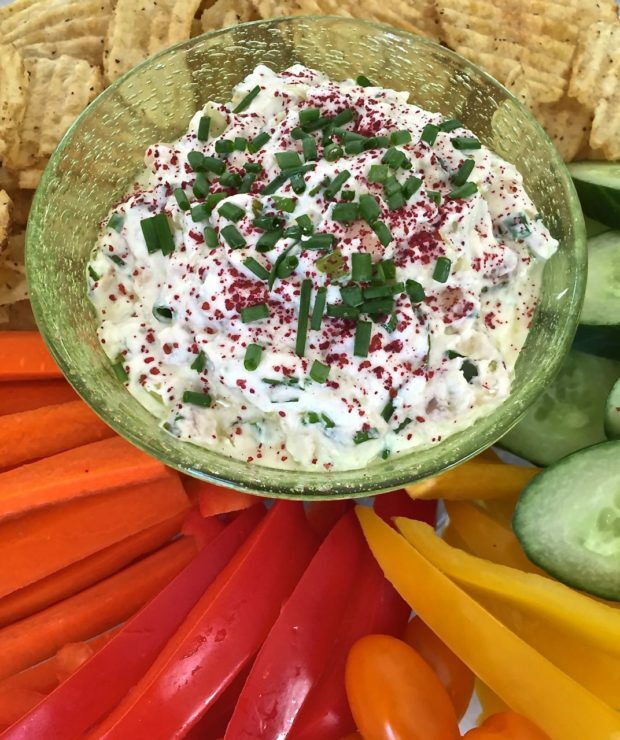 A hallmark of my teenage years, I hadn’t tasted this dip for a long time until a friend started hosting an annual neighborhood gathering where she served the famous combination. No apologies when I say it’s hard to pass up that familiar flavor profile. 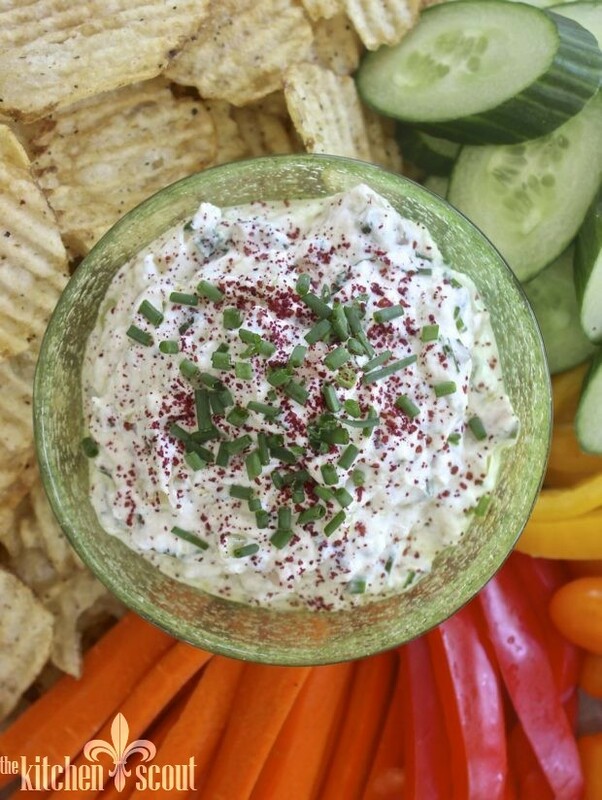 Well, I discovered a much healthier version of this old-school dip in Saveur magazine last year and have been making it ever since. 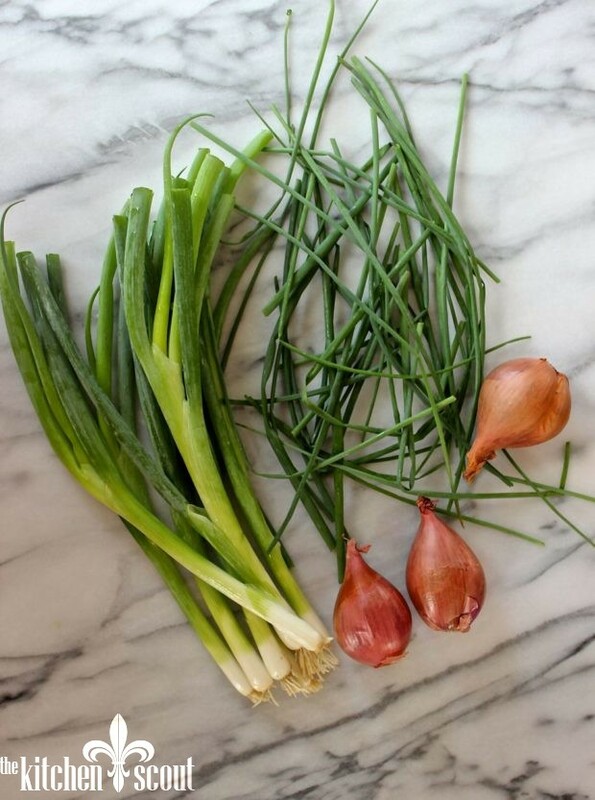 This version has intense flavor from a combination of shallots, scallions and chives. However, it is much lighter and brighter because it uses tangy Greek yogurt, rather than sour cream or mayo. One friend who tasted it last Fall lit up and said it transported her back to the 1970’s. I have to agree! Once cooled, they are mixed with the Greek yogurt and some freshly chopped chives. Season with salt (don’t skimp) and freshly ground black pepper. Once chilled, garnish with additional chopped chives and some ground Sumac which you can find at Middle Eastern markets. Sumac imparts a slightly lemony flavor and is pretty in color. If you don’t have any, you can either omit it or substitute some freshly grated lemon zest. 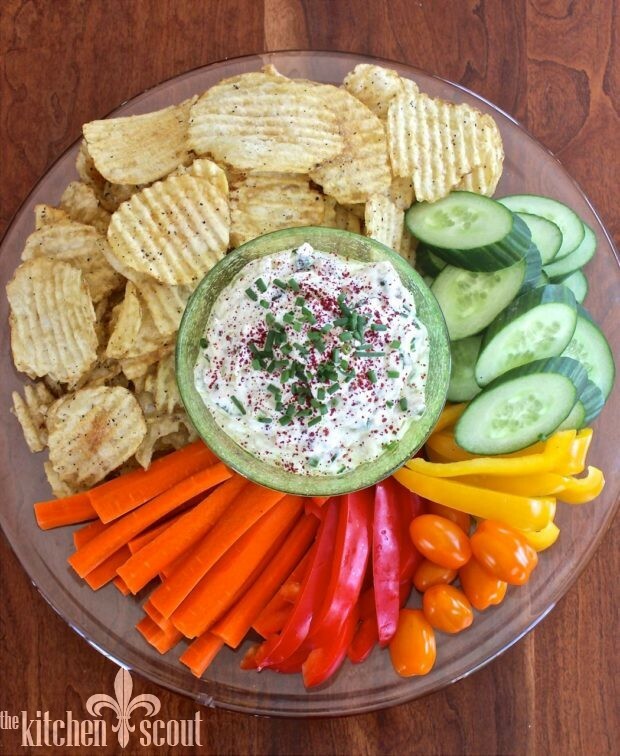 More Dips from The Kitchen Scout! Have a wonderful Fourth of July! Stay safe out there. 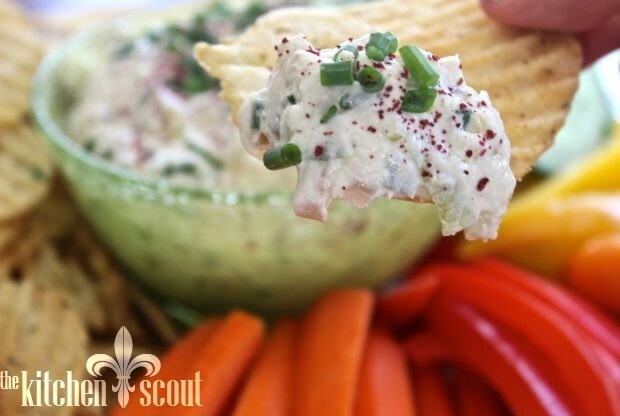 This dip has more flavor than the old-school onion dip and is lighter and healthier at the same time! 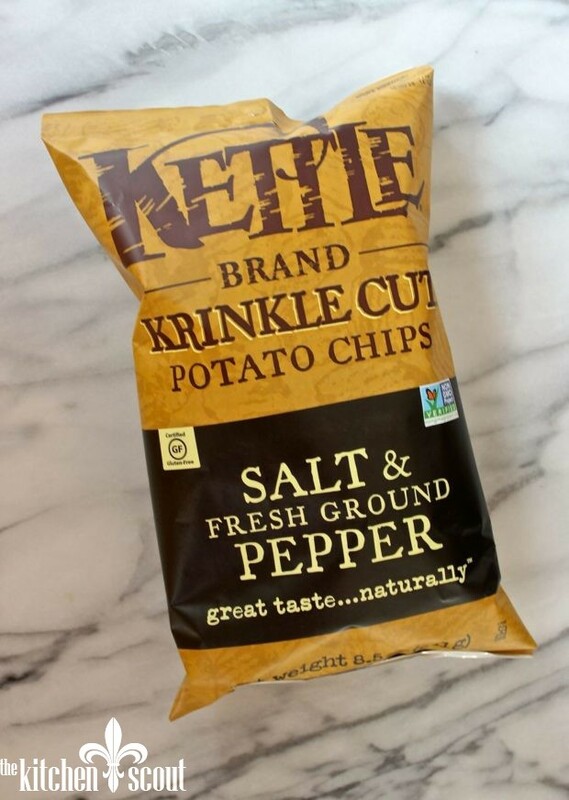 I love to serve this with Kettle brand Krinkle Cut Salt and Pepper Chips. Cook shallots and sugar until shallots are soft, about 5 minutes. Add the scallions and cook 3 minutes more until soft. Remove from heat and allow to cool. Stir in chives. Mix onion mixture and yogurt in bowl. Season with salt and pepper to taste (don't skimp on the salt!). Refrigerate for at least 1 hour before drizzling with olive oil, additional chives and sumac or lemon zest. Serve with chips and/or crudites. Making it again for today’s tailgate. Tom and Gisele would appreciate this healthier version. Go Pats! This is perfect tailgate food, Mary! Go Pats! Glad you liked it, Pam! Thanks Val! I grew up eating an after-school snack of pretzels and “French Onion” dip and this one sounds a whole lot lighter and even more delicious than the Pittsburgh classic!